The Fellowship was fortunate enough to obtain a copy of EDGAR ALLAN POE’S THE RAVEN AND THE RED DEATH one-shot from Dark Horse Comics. Richard Corben writes and draws. A man’s obsession with his lady love and an annoying bird herald the man’s downfall. A kingdom tries to resist a deadly plague until its king makes a mistake fatal to all. Poe’s best-known classics are brought to life by the legendary Richard Corben. Featuring Mag the Hag! It’s the art that tells the tales in this volume. I especially liked his use of color, with the light contrasts of Lenore in the Raven, and the bright rainbow colors of the party and the reds flowing into black in the Red Death. Both of Poe’s works lend themselves to such a visual interpretation, and Mr. Corben does not disappoint. This book is a beautiful imagining of two of Poe’s masterpieces, and just in time for Halloween enjoyment. I certainly recommend it. 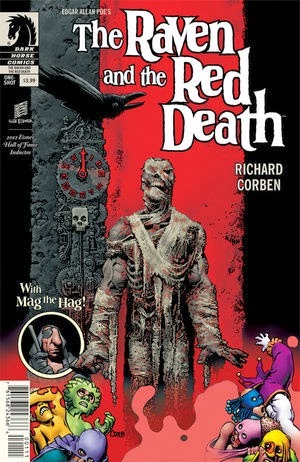 EDGAR ALLAN POE’S THE RAVEN AND THE RED DEATH is available now at your FLCS and online at darkhorse.com.